Fisherman and ocean lovers alike can show off their passions with a blue marlin tattoo. Animal tattoos are frequently used as a way to bring the symbolism and meaning of the animal to the wearer. Fish symbols and shrines can be found dating back as far as 2500BC, making the symbol of the fish one of the oldest known to man. The image of fish, including the blue marlin, has many meanings across multiple cultures. In the Hindu culture, the image of the fish is used to symbolize marriage. The bride entering the house for the first time does so with a fish in her hand. In many cultures including Celtic and Egyptian, the symbol of the fish was used to call for a woman's sexuality. In many cases it was also used to symbolize birth and strength during travail. The blue marlin in particular is an image thought to give great power to the holder. 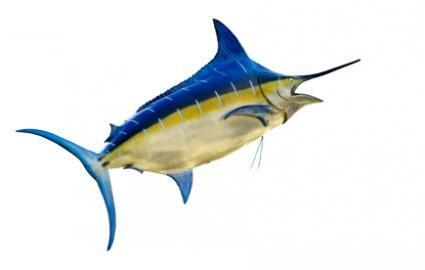 The marlin is a large, powerful fish, which puts up a tremendous struggle and fight against capture. Wearers of the blue marlin tattoo could be said to be fighting a similar struggle for of power for freedom and control in their lives. While Hemingway denied any symbolism in his book, The Old Man and the Sea, the blue marlin has become through this book, a symbol of struggle and endurance. Some members of the Christian faith have further adopted the symbol of the marlin as their own struggle. Whatever the reason behind the choice to get a tattoo of the blue marlin, try some of these style and design ideas to help make the tattoo as beautiful as it is symbolic. Bring your tattoo to life by giving the marlin the shape it would make leaping from the water. Twisting the marlin around itself, tail curled in is a way to demonstrate the power and strength of the animal. Silhouette the marlin against the image of the sun for a tattoo with additional depth and meaning. Included in the tattoo could be a small section of the water itself; the marlin leaping high above the ocean to be seen against the sun further demonstrates its power. Challenge two marlins to a dual by having their swords interact with one another. This could be a wonderful way of displaying both strength and conflict at once. Include the blue marlin in its natural element in a full ocean scene. Include other sea creatures, seaweed, rocks, waves and other images to complete the design. While a blue marlin tattoo can be very popular amongst maritime tattooers, fisherman and those interested in animal symbolism alike, the image can be worn proudly by anyone. Choose this majestic fish for any of the symbols others have brought to it, or create your own to include the strength and beauty of the marlin in your life.